I am 15 years old and i recently found out i have acne vulgaris and alot of zits all over my face, especially on the cheeks to my forehead and chin. In the past i have little acne yet i thought proactiv would heal my acne. It was the worst decision of my life especially when i had decided to stop using it. 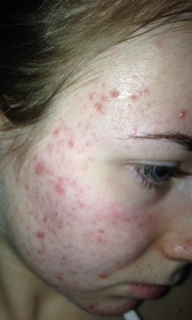 When i had been using proactiv, my skin was clear but when i had stopped using it my acne just burst. Ever since then i have used everything literally. I've tried coconut oil, natural organics, prescriptions, etc and nothing has worked since then. Everyday i have to go to school with foundation over my face to cover it up and i really hate that. I've tried milk of magnesia, but it only worked on clearing away the cystic acne/pimples on my face and didn't really help clear the vulgaris. I really want to have my clear skin back and i thought products like the regimen would help me get it back since its similar to proactiv in the same way. I would appreciate some feedback or ideas that would help! This is really a decision you will need to make for yourself. The Regimen works very well for most cases of acne when it's used strictly, however keep in mind that like most acne treatments it is not a cure but a way to manage acne prone skin on a daily basis. It only works while you are on it. If you would like to see how well it does work, please look through the success stories.